I am feeling very mellow as all Christmas gifts have been sorted and I pity the poor people who have got to do their shopping this weekend in the rain and the cold! Firstly I must tell you the result of the giveaway, the winner chosen by the tried and trusted random number generator method and is Textiledreamer. Please could you message me at alisonmryan@yahoo.co.uk with your address and I will send your goodies to you. 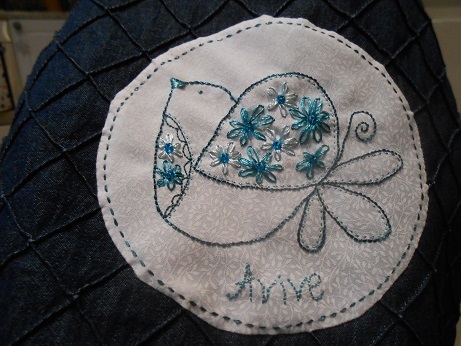 As well as the last of the quilted ornaments I have been stitching up a little gift for one of my relatives. My cousins all have young children and I love making things for them, especially as most of them have unusual names so I like to make personalised things. This little bag is for my cousin’s daughter who is five and loves anything art related so I have some creative things to fill it with, as well as some Frozen goodies as she is still a big fan of the movie. 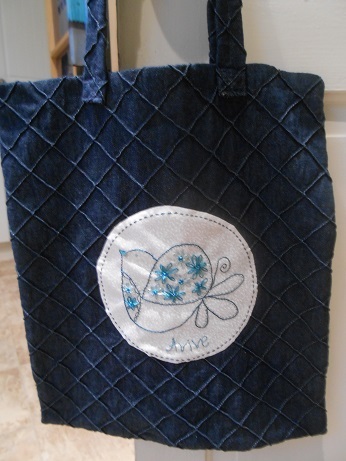 The actual bag was from the Quilt Festival in the summer, won on the fund-raising bag tombola and the design is another version of Jenny of Elefantz’s Button Bird. I have used some new rayon threads for this, I love using silk but thought rayon might be better for a bag as it will get more wear than a picture. 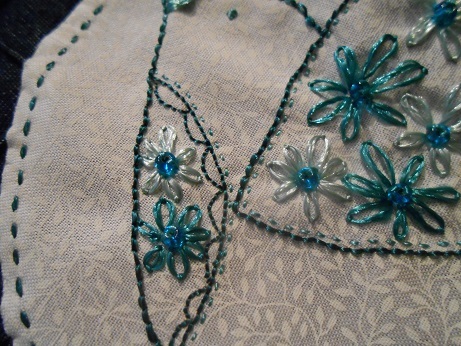 I have also enjoyed perfecting my lazy daisy stitches. 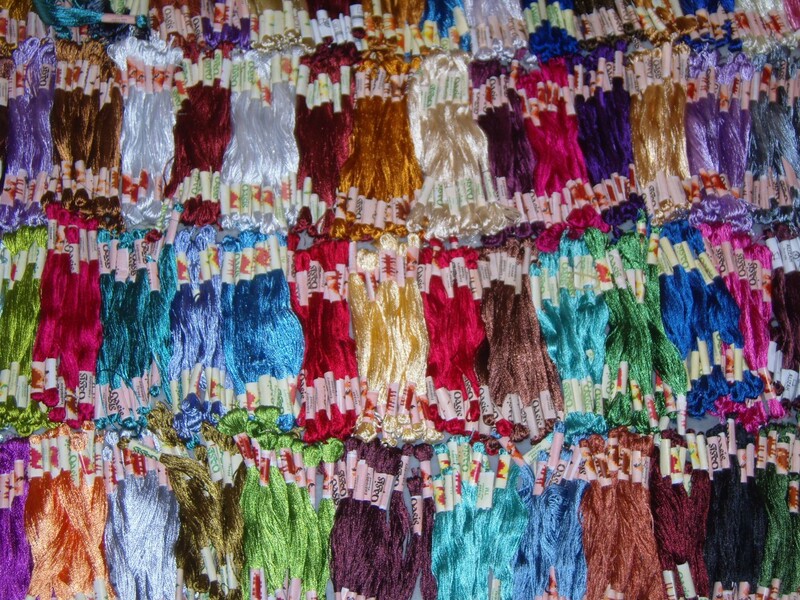 I obtained these threads as a bundle from an Ebay seller, The Shopping Window who have lots of beautiful threads and ribbons for sale, I got 75 gorgeous colours like these so can’t wait to use more of them in future projects. OK off to make more ornaments now, will post some pictures of the final ones later in the week. Have a lovely weekend and thanks for visiting. Yay! I won something! Thanks a lot for the giveaway, I’m looking forward to what will be in my mail. So glad that you are pleased, the goodies will be in the post on Monday. I find rayon a bit tricksy to work with, but it looks lovely and takes colour gloriously! Yes it was a bit slippy but it was ok for this small project and I love all the colours I have got.